Participants and Speakers of the ESPResSo Summer School 2013. ESPResSo , ESPResSo++ and VOTCA are open-source program packages that have been designed specifically to study coarse-grained soft matter systems, and they are used by more than 100 institutions worldwide. The packages are developed at the ICP at Stuttgart University, Germany and the Max-Planck-Institute for Polymer Research in Mainz, Germany. All three applications are tools that make it significantly easier for PhD students and researchers in general toget started with their projects. 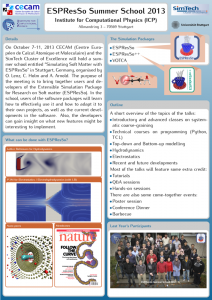 Between October 7-11, ICP, the SimTech Cluster of Excellence at Stuttgart University and CECAM (Centre Européen de Calcul Atomique et Moléculaire) organize the SimTech-CECAM-ESPResSo Summer School 2013. The school provides a detailed and hands-on introduction to the software packages and their uses. The school consists of Lectures and Hands-on Sessions, both for beginners as well as for experienced users and developers of ESPResSo, ESPResSo++ and VOTCA. The introductory sessions aim to introduce the general ideas and usage of ESPResSo and its most common features for the simulation of a broad variety of soft matter systems. The advanced sessions are offering a more in-depth look into the code of the software and additional algorithms and possibilities of ESPResSo++, VOTCA and ADResS. It is aimed to attract researchers who are already familiar with the basic ESPResSo features and want to build on that or want to extend and optimize the code to better match their simulation setups. Furthermore, there will be a Poster Session and Lightning Talks where participants have the opportunity to present their projects and ideas with the other participants and the speakers, and a number of Scientific Talks where scientists will present recent research projects that were done with any of the software packages. Another aim of this school is to give the developers of the software packages feedback on ongoing research on soft matter, so that design decisions better match the needs of the community. Unfortunately, we are not able to provide financial support for travel or accommodation. You will have to access your own funding sources to cover these costs. There are no fees for the school itself. If the rooms in the International Student Hostel are all occupied, consider the ETAP hotel in Stuttgart. Stuttgart can be reached by plane (airport code STR) or by train (“Stuttgart Hauptbahnhof”). Both from the train station and the airport the ICP as well as the ETAP hotel can be reached easily by public transport. Details will follow on this page. We want to give the participants ample opportunity to present their own work and ideas. On Monday evening (17:00-18:00), we will have Lightning Talk Session of one hour, where people can present a very short talk. Lightning talks are intended to present finished and unfinished ideas of projects to be discussed with interested people afterwards, or to tease people to your poster. Depending on how many people want to give a lightning talk, the time per talk will be adapted (probably something between 5 and 20 minutes). If you want to give a lightning talk, please send an email with the title to ess@icp.uni-stuttgart.de. We will hold a Poster Session (and a BBQ) on Tuesday evening where most people from our institute will put up their posters. If you have a poster that you would like to present, just bring it along! Note that the posters can most probably stay mounted on the poster walls during the whole school. If you have a Laptop, please bring it along! We will have some desktop computers where you can do the hands-on sessions, but we recommend to bring your own machine. It should provide some kind of POSIX OS (i.e. basically anything but Windows). On Wednesday evening, we will have a Conference Dinner. Unfortunately, we cannot fund the dinner for the participants, but only for the speakers. Participants are invited to join the dinner, anyway. The school will end on Friday by 13:00, so that most people can still travel home on Friday. From ICP to Stuttgart airport you will need about 30 minutes.